This classic Clipped-Wing Taylorcraft features design and construction techniques that were pioneered by Stevens AeroModel. State-of-the-art CAD/CAM systems are used to design their models. Unique tab and notch construction allow a quick and simple build, which can help a pilot get his model in the air quickly. The docile, yet nimble flight performance of this model can provide the pilot with plenty of excitement indoors at the local gym, or outdoors in calmer weather. 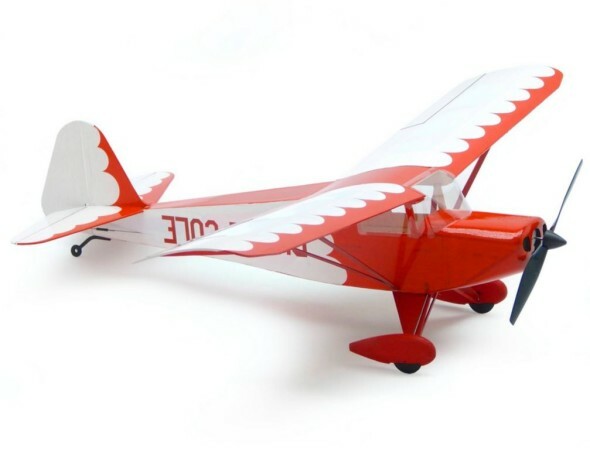 The beautiful red and white color scheme used on this model, complete with upside-down name on the fuselage, is based on a version modified by John Vasey and flown by world-famous aerobatic pilot Duane Cole. Wing Area: 64 sq. in.